Below are some examples of how the campaign was implemented. Deb received great feedback from prospects, many of whom made an effort to connect with her directly to thank her for the unique gifts. Deb followed up mailers with a phone call, using the mailer as an effective ice breaker. The gift arrives in a padded envelope with a branded label that says “Gift Inside!” Addresses are hand-written for a personal touch. Inside the padded envelope is a white jewel box, tied with gold string. The jewel box is intentional; we're conditioned from an early age to associate boxes like these with items of value. 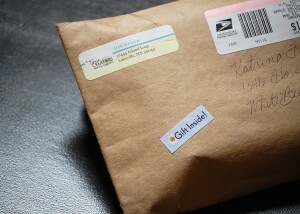 The second mailer. 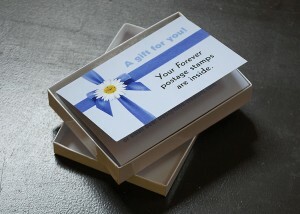 Inside the box is a trifold gift wrap, announcing "Your Forever postage stamps are inside...". 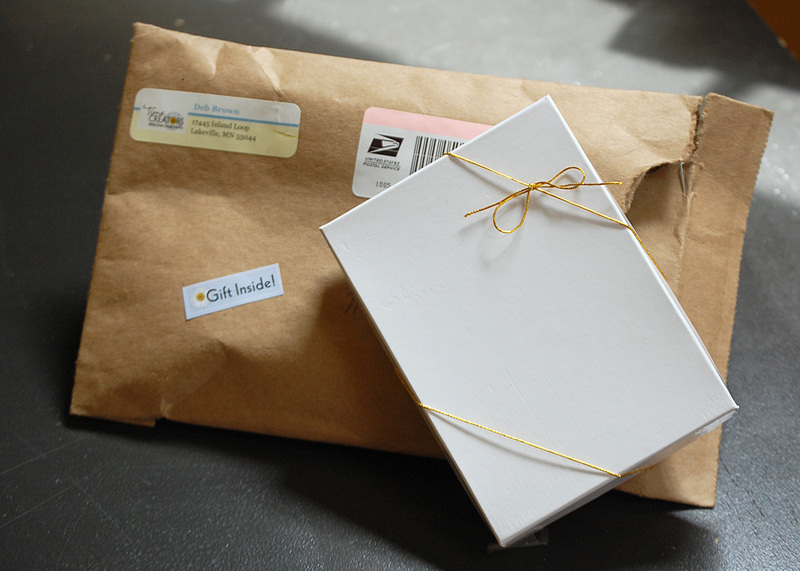 Inside the trifold gift wrap: the payoff! 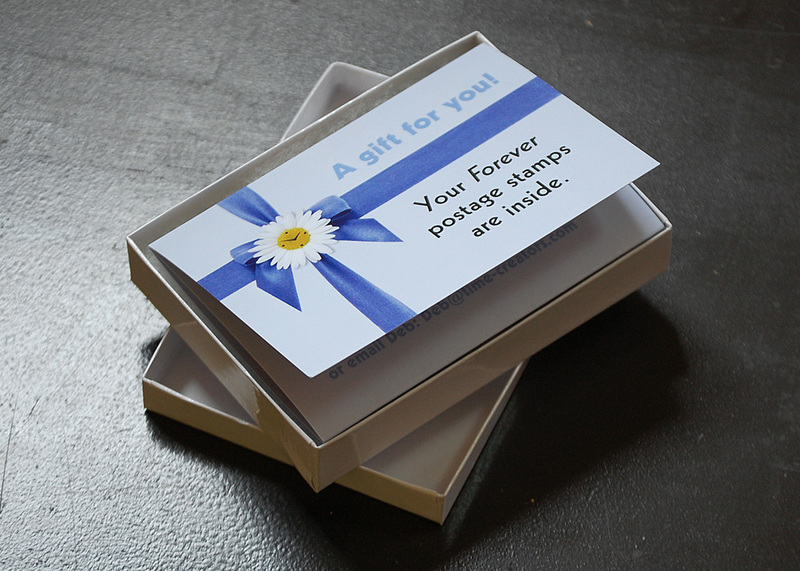 A small book of Forever postage stamps. 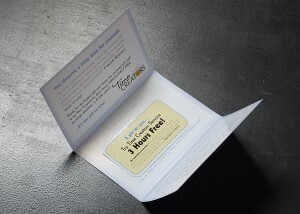 The trifold also lists services, features quotes from satisfied customers, and includes a call to action to try Time Creators for two free hours when the recipient mentions the mailer. 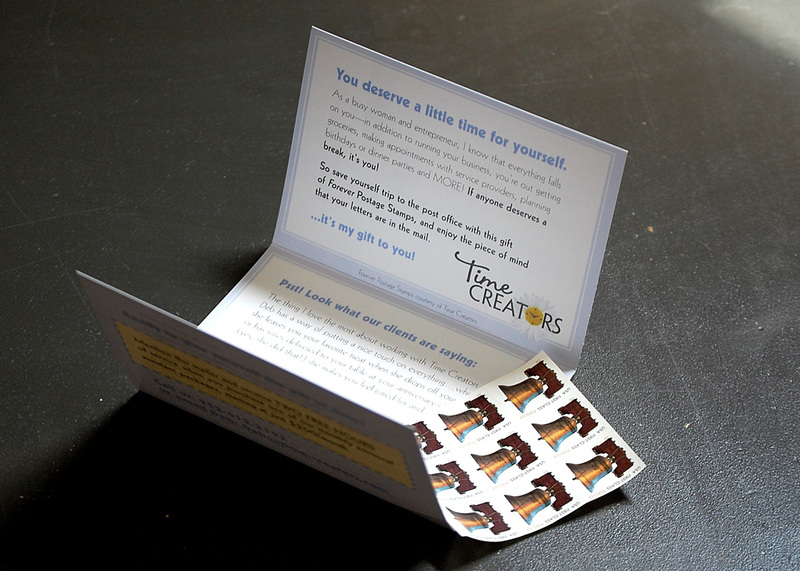 The final mailer features a gift wrap announcing a Time Creators gift card inside. The inside of the final gift wrap includes a printed gift card on heavy stock, laminated paper, that looks and feels substantial. The card is in place with a removable glue dot, and can be tucked into a wallet or business card file. 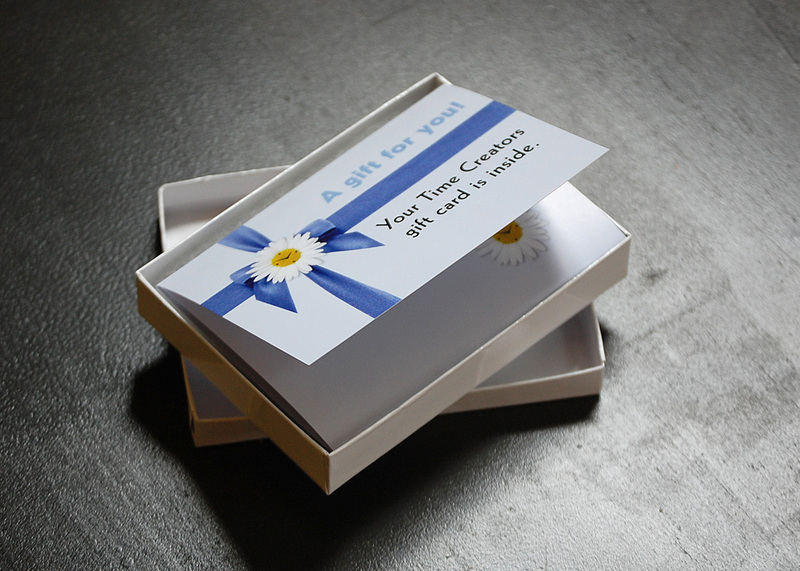 In fact, the back of the card echoes the look and content of the Time Creators business card. Copywriting and design by Katrina Hase of Mix Creative. Printing by Printz.com. Special thanks to Deb Brown for implementation of the mailers, which required a hefty amount of hand labeling, wrapping, and sealing! This entry was posted on Thursday, July 14th, 2011 at 6:05 am and is filed under Business Practices, Design Tricks and Tips, Marketing your Business, News from Mix, Uncategorized. You can follow any responses to this entry through the RSS 2.0 feed. You can leave a response, or trackback from your own site.